Native People: Erin O'Doherty and her children Selena Young (left) and Gracie Young. Doherty's Native Revival Nursery seeks to bring plants indigenous to this area's ecosystem back into fashion. Once, as a joke, I decided it would be funny to outfit my friend's car with a plume plant I found in a field that had gone to seed. Arranged just so in the ski rack on top of her car, the added flora gave her tiny Honda Civic the air of a jaunty hat with a feather in it. But it wasn't long before we were verbally assaulted by a local native plant stalwart, who berated us for spreading the seeds of a non-native plant all over the ecosystem. Years later, I laughed about the incident with my accuser--a biology student--when I met him as the brother of my new housemate. "Sounds like something I'd do," he said. That's small town life for you, but the experience also says something about the generally high level of awareness about things like native plants and ecological sensitivity in town. Farmers market vendors take pride in their locally grown seasonal fruits, vegetables, flowers and plants. Even dedicated carnivores can chow down on locally raised grass-fed beef for a reasonable price. Erin O'Doherty's Native Revival Nursery takes the native ethos into the realm of landscaping, both for its healthy effects on our local ecosystem, plus the added perk that the landscapes she designs are virtually maintenance-free. "A big part of my clientele is people who just want to get rid of their lawns because they're so much work," says O'Doherty. "They say, 'We want a landscape that takes care of itself that we don't have to maintain.'" And that's exactly what O'Doherty and Co. deliver. But first--what to do with all the fancy high-maintenance lawns and plants? "We remove them," says a remorseless O'Doherty, as tears well up in my eyes thinking of hacking down Simon, my dwarfed Eucalyptus tree, which I saved from a broken home in New Zealand. "We go into sites all the time that are covered in ivy and sod. Scotch broom is huge--we have volunteers who go out on weekends and pull it out by hand. And the ground cover along the coast, the ice plant? That's not what's supposed to be there." Before you, like me, start getting all teary-eyed over your lawn and your invasive ice plants, get a load of a few of these statistics from a science journal called Conservation Biology: "99 percent of the native grasslands, 95 percent of the coastal redwood forests, 89 percent of the riparian woodlands and 91 percent of the wetland habitats originally found here are now gone." Indeed, instead of crying, think of all the new friends you'll make. Because by going native, you'll attract more native wildlife, like butterflies and lizards and birds. Oh my! "People are always surprised," says O'Doherty, "in Santa Clara County, which has much less wildlife than around here, they're so surprised to get things like dragonflies and lizards in their yard which have never been there before. What's interesting is how fast the wildlife appeared on the plants, and how did they find it?" Well, I don't know, but I tried to ask a raccoon once and it bit me. Plus, such knowledge is beside the point when Native Revival does your landscaping; they design your yard, install the goods and fine-tune it every year or so. "Usually they require no fertilizer," says O'Doherty, "and what our landscapes require is an annual maintenance, and it's not even something that you have to do. When I first started and I was coming form a gardening background, people wanted us to come once a week, but there was nothing to do. Even once a month, we were pruning things you didn't need to prune. We usually just go once a year at the end of summer and prune the dead flowers, which is a far cry from most garden setups where they come out every week and they mow and blow and that kind of thing." 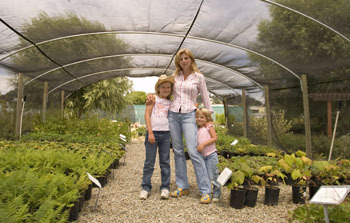 Native Revival Nursery is located at 2600 Mar Vista Drive in Aptos. For more information, call 831.684.1811 or visit www.nativerevival.com. From the date-date issue of Metro Santa Cruz.